Facebook has announced that it is making some major changes to the way it runs ads on its platforms. The single biggest change is the launch of the previously-announced ‘paid for by’ labels on ads that are either directly political, or inherently political, and thereby, contentious in nature, including gun-rights, abortion, immigration, foreign policy and others. You can check out the Facebook video detailing the announcement here. The new changes will bring disclosures about campaign budgets, and details about who saw the ad, including their age and gender. The details will not only allow users to make up their own minds about the political alignment of the ad-buyer, but also help people get an idea about the exact demography of users who are seeing the ad. The company also says that it will make its data publicly accessible at facebook.com/politicalcontentads for seven years from the day the ad first runs. The new policies have already gone live on both Facebook and Instagram. Many political experts are calling on social media sites to put a blanket-ban of political ads to prevent a repeat of the 2016 US presidential elections which were clearly swayed by ads and fake news campaigns run on Twitter, Facebook, Tumblr, Reddit etc. Such ad campaigns and bot-driven propaganda may have also affected the Brexit vote in the UK, which also returned an unexpected result. However, Facebook says that it will continue to serve political ads, if only to serve a social purpose. 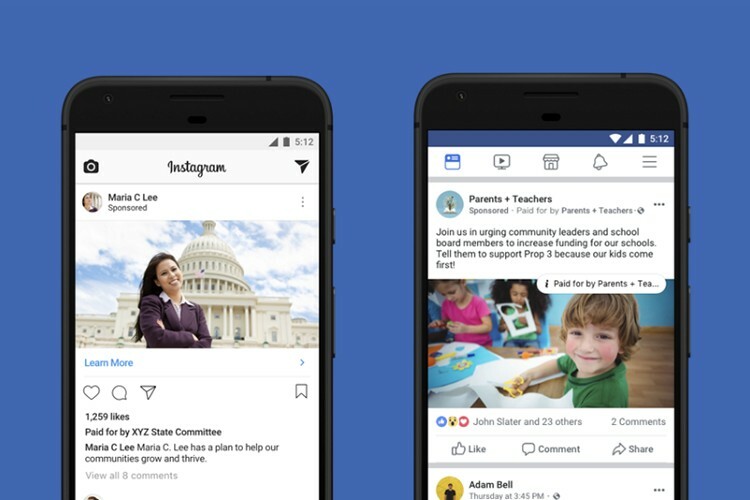 Meanwhile, Facebook isn’t the only major social networking platform that will enact these changes to clearly mark who is paying for which political ad. Twitter says it will include a ‘learn more’ button so that people will be able to identify and contact the ad buyer in political promotions. Twitter is also going to identify and mark election candidates in the US as such. The new feature will be incorporated as part of the company’s new ‘Ads Transparency Center’ initiative, that is only expected to arrive by the end of the year.